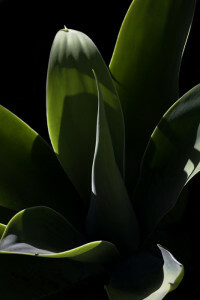 I saw this agave while walking around a neighborhood in Los Angeles, California. Low angled evening light simultaneously etched bright lines on leaf edges while casting most of the plant into velvet shadow. Its graphic beauty entranced me. I came back to the same location twice, but the light wasn’t quite right until my third visit. I set up my tripod on the curb and watched lighting on the agave shift gradually as the sun set. Only minutes before the sun dropped below a distant ridge for the night I captured this photograph. I have developed the image in a way that highlights the agave’s graphic form.